Don't Miss Our First Fundraiser of the Year! Inroads to Opportunities is now selling Inroads SWAG! 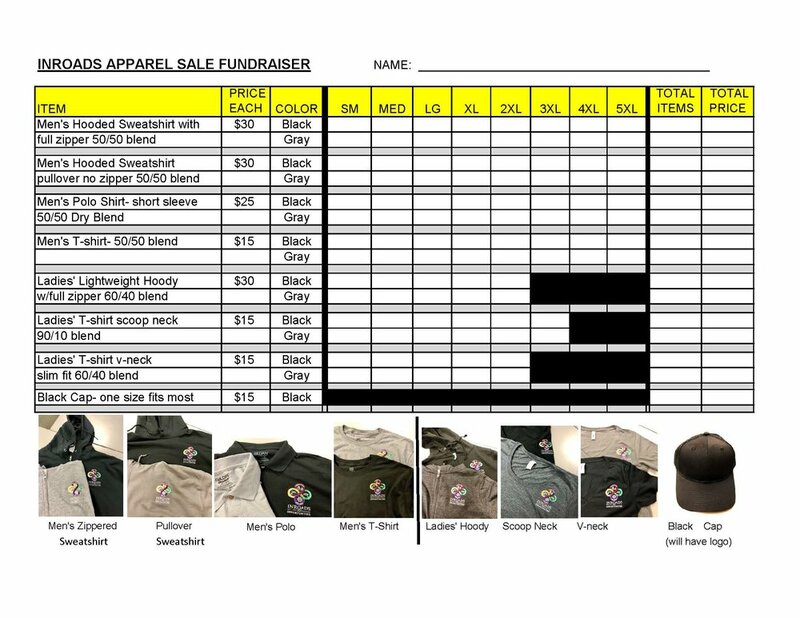 Click the image below to open a PDF of our order form. Friday October 12th, Inroads to Opportunities held it’s annual Casino Night Fundraiser at the Elks Lodge in Union, New Jersey. 180 guests competed in classic casino games, which included Blackjack, Craps, Let It Ride and Three Card Poker. Class Act Casino Company provided amazing tables and entertaining dealers who taught the games and kept everyone playing all night. Guests cashed in play chips for raffle tickets to enter our 37 basket tricky tray. Each basket was worth a minimum of $150 each and our generous vendors helped us to make this years prizes extra special. We are proud to announce that this years event net $17,300 for our Charity. This is a record year for our agency in terms of fundraising and we couldn’t be more thankful! Inroads own Railside Cafe provided a delicious buffet, which included Chicken Marsala, Roasted Vegetables, Pot Roast, Penne Vodka and an assortment of deserts from our bakery. Chef Paul O Loughlin did a fantastic job with his staff Johnny, Kevin and Takiesha. Our generous sponsors included: Roselle Bank, Investors Bank, Wells Fargo, Spire Group, Meeker Sharkey, Bank of America US Trust, Hehl & Hehl, Tom Digiorgio, Stickel Packaging, Arcuri Truck & Trailer Repair, Ronstan Paper & Packaging, Premier Plus. Thank you to our family sponsors: Stern Family, Russ Family, Barile-Barra Family, Fusco Family, Miller Family, Hoffman Family, Kraft Family, W&L Pasko. Our 2018 Community Award Recipients included: Roselle Bank, Globe Footwear, Mrs. Rita Mellito and the late James Mellito, Ana Cicchetti-Investors Bank, and Tribeca Oven Inc.
On Wednesday August 22nd, Inroads To Opportunities held it's second annual Summer Splash at it's own Railside Cafe in Fanwood, New Jersey. 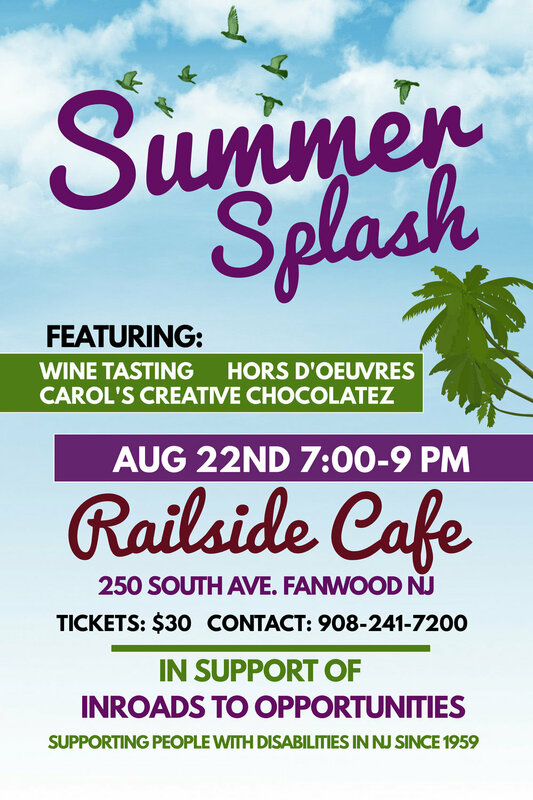 Summer Splash featured the amazing chocolates of Carol's Creative Chocolatez of Somerville, NJ (recently voted the best chocolate in New Jersey) paired with a variety of wines sponsored by Total Wine and More of Union, New Jersey. Railside Cafe featured mouthwatering Gelato samples, delicious Hors D'oeuvres along with a beautiful cheese station sponsored by Karen Rotter of Shoprite in Clark, NJ. General Manager Paul O'Loughlin of Railside Cafe did a fantastic job catering the event and we applaud our staff for their support in preparing and serving for this fundraiser. 80+ guests came out to support Inroads To Opportunities, which resulted in a $1300 net profit for our charity. Summer Splash was one of two smaller fundraisers that we held this year. Play It Forward Fundraiser back in winter of 2018 helped us to raise $1,000 for Inroads To Opportunities. Inroads Casino Night will be held on Friday October 12th at the Elks Lodge in Union, NJ. We anticipate raising $25,000 for our program and participants. As a part of a re-branding for our cafe, Railside Cafe had an official grand re-opening the next morning on Thursday August 23rd. Earlier this year we asked customers of Railside Cafe (previously Mara's Cafe & Bakery) to vote on a new name for the cafe. We received 250+ name suggestions and arrived on Railside Cafe thanks to a Fanwood local who came up with the name while having lunch with his wife. Saturday January 20th Singer Songwriter Joshua Van Ness hosted Play It Forward: Inroads To Opportunities. The event was held at Pino's Wine and Gift Basket in Highland Park, NJ and featured 3 hours of live music for a great cause. Performers included: Joshua Van Ness, Matt Telliho, Kim Boyko with Nick Bizzaro and Bryan Hansen Band featuring Tony Scardaci & Elana Segal. With over 40 people in attendance the Fundraiser raised $920.00 for the program participants at Inroads To Opportunities. Food was generously donated by Haileys Harp & Pub of Metuchen, NJ as well as Novita Bistro & Lounge. Two additional food trays were donated by Diane Porter and a private donation from Mara's Cafe & Bakery Fanwood. We would like to thank all the performers for making this event possible. Thank you to Pino's Wine and Gift Basket for donating the space. Joshua Van Ness for choosing Inroads for this years 'Play It Forward.' Max on the sound board and Matt Telliho for filling in and taking photos. Special Thanks to Melissa Peterson for all her hard work to make this event run smoothly! One Week Ago, Inroads to Opportunities hosted Comedy For A Cause at the Union Elks Lodge. C4C featured comedians Johnny Lampert & Sherry Davey, live music from Kim Boyko & Bryan Hansen and over 20+ basket raffles. With the help of our sponsors, supporters and basket donors, Inroads net $12,000 from this fundraiser. We cannot thank you enough for supporting us and would like to acknowledge each of you. Special thanks to Mara's Café Fanwood for catering our event, Inroads Cafet...eria Staff, Jessica Potash for donation solicitation and to our events committee. Comedy For A Cause This Week! On the evening of July 27th, 2017 Inroads to Opportunities hosted a Fundraiser at Mara's Café & Bakery in Fanwood, NJ. The private event brought in 100 guests to sample a variety of wine, cheese and chocolate. Sponsored by Roselle Savings Bank. Inroads net $2600.00 during the Fundraiser, which will benefit the services they provide to adults and teens with disabilities in Union County, NJ. Special thanks to our vendors: Carole's Creative Chocolates, Shoprite in Clark and Mara's Café & Bakery Fanwood. 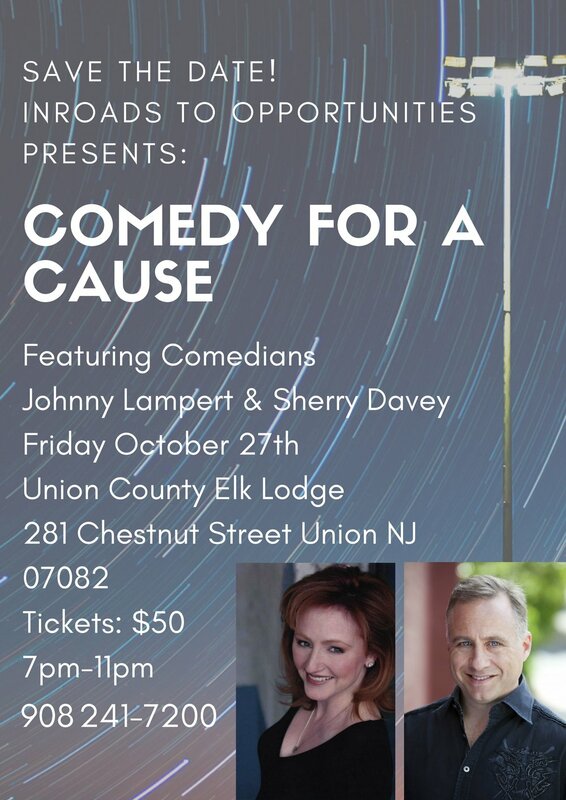 Inroads next Fundraiser will be held on Friday October 27th at the Union County Elks Club featuring comedian Johnny Lampbert. 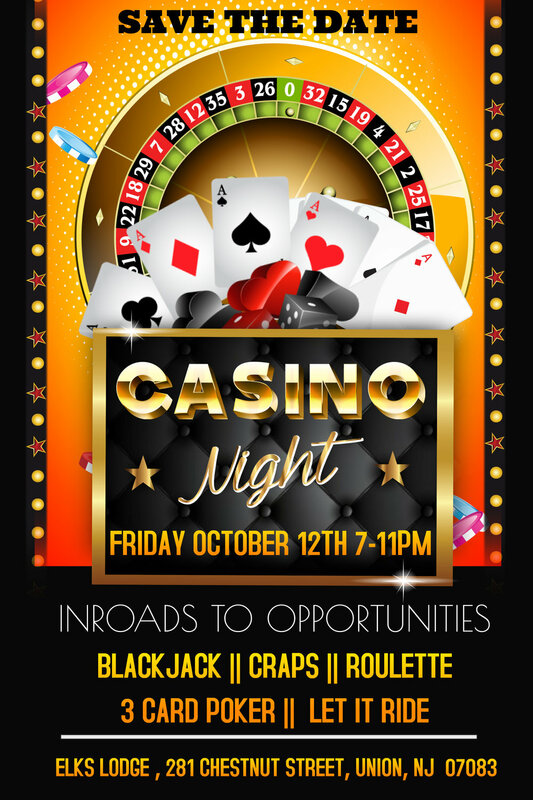 On Friday October 21st, Inroads to Opportunities hosted it's annual Casino Night at Gran Centurions in Clark NJ. Since the event was so close to Halloween, this years fundraiser was a costume party. Hosted by Traveling Dice, guests helped raise money for people with disabilities in Union County. Gaming included Blackjack, Roulette, Money Wheel and Craps. Guested traded in their winning chips for raffle tickets to participate in an amazing Tricky Tray. Prizes included: Disney and Universal Park Hopper Passes, Concert Tickets, SPA Day Packages, Restaurant Gift Certificates, Gym Memberships and much more. We would like to personally thank our Board of Directors and Sponsors for this great evening. Roselle Savings Bank. Investors Bank. Joseph Torsiello, Wells Fargo Advisors, Curchin Group, Bank of America US Trust, Hehl & Hehl, Northeast Services Inc.
Casino Night 2015 took place on Friday October 2, 2015 at the Gran Centurions in Clark, NJ. Hosted by Inroads to Opportunities, the evening was an entertaining fundraiser to raise money for adults with disabilties. Formerly the Occupational Center of Union County, Inroads to Opportunities is a vocational, mental health, and employment center that services 400 individuals with developmental and intellectual disabilities per year. The agency is located in Roselle, NJ. Jo Ann and John Kovalchik were presented the Outstanding Service Award for their long term service on the Board of Directors and their ongoing support of people with disabilities. JoAnn serviced on the Special Events Commitee for many years. Kovalchik was insprired to enter the field by her sister Mary Ann whom worked at the Occupational Center. John Kovalchik continues to play an important role on the board of directors, and for some time served as President of the board. Guests at Casino Night played roulette, craps, blackjack, and bet on a money wheel courstesy of Tumbling Dice. At the end of the night the chips were cashed in for ticket stubs, which turned into a tricky tray with thosaunds of dollars in prizes. Some of the prizes included NY Jets Tickets, 2 nights in Caesar's AC, Airfare to Las Vegas, Gift Certificates for massage, restaurants and fitness centers, NY Red Bulls Tickets, Wegmans Gift Card and Mohegan Suns. We thank everyone who attended and look forward to seeing you next year!